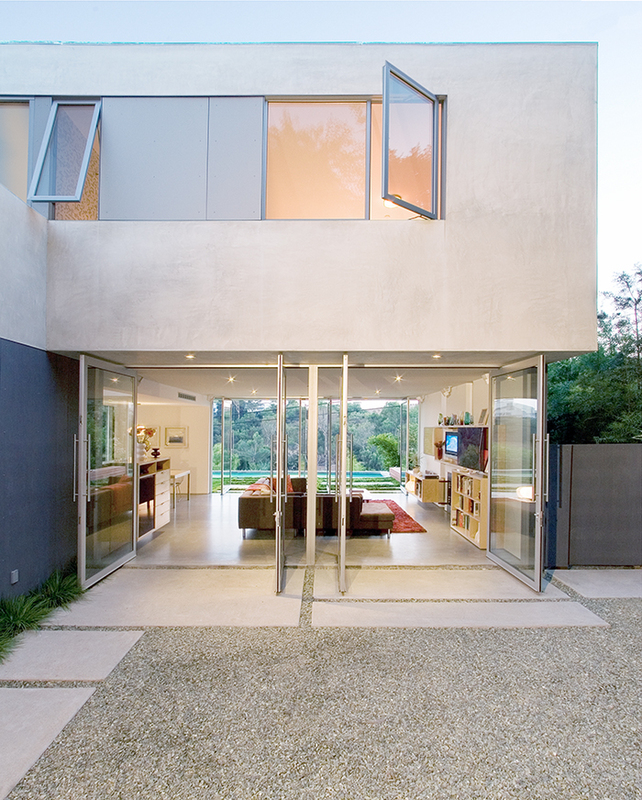 This self-driven tour of modern homes winds through the East Side of Los Angeles on June 21, 2014. Click through the slideshow to see the homes on the tour that wrap around the hills above Silver Lake, the canyons surrounding Mt. Washington, and the dramatic Hollywood Hills. Though the tour is sold out, buy your tickets today for the West Side Home Tour! Faced with a sloped property in the developed suburban neighborhood of Mt. Washington, architect Michael Ferguson cleverly positioned VillaCasa's lower level in the center of the property. The end result is a home combining expansive views and privacy with the comforts of a less formal retreat. Photo by Joshua White Photography. Michael Ferguson designed VillaCasa with large glass doors that pivot open from the living and dining areas to the terraced courtyards for an easygoing indoor-outdoor feeling. Photo by Joshua White Photography. The family home of architect McShane Murnane and his wife Cleo Murnane sits 70 steps up from the street in the Moreno Hills of Silver Lake. The home's clean lines, natural light, and early modernist details amount to a pared down, modern beach house style, 20 miles from the ocean. Photo by Mimi Giboin. This cantilevered home by Escher GuneWardena Architecture in the Silver Lake neighborhood hovers above the sloping site, supported by five piers covered in vines. The architects sharply angled the street facade, offering views of the nearby lake. Photo by EGP Imaging. Set in the Hollywood Hills, the Lecam Residence designed by Vianney Boutry features stunning views in all directions. To the East is the Griffith Observatory and Sunset Boulevard, and to the West the Pacific Ocean extending to Catalina Island. Photo by Chase Brock/Lawrence Anderson Photography. To maximize the scenery in the Lecam Residence, Boutry replaced a wall in the master bedroom on the third floor with glass, and kept color and furnishings to a minimum: white oak floors, recycled wood cabinetry, and mostly white paint with touches of color. Photo by Chase Brock/Lawrence Anderson Photography. Set in a grove of eucalyptus and pine trees, the Glen Oaks Residence by architect Douglas Ewing, FAIA, features views of the Rose Bowl, Pasadena, and the San Jacinto and San Gorgonio Mountains. Photo by Magnus Stark Photography. Buy tickets here to experience Dwell on Design's East Side home tours in person!